The films of Gus Van Sant, be they the good (“To Die For” or “Drugstore Cowboy”), the total miscue (“Psycho” or “Even Cowgirls Get the Blues”) or even a crowd-pleasingly mainliner (“Good Will Hunting” or “Milk”) have always been embossed by a gritty, streetwise authenticity. That’s Van Sant’s gift – plus, by skill, proximity or both, educing some of the great performances of the past 20 or 30 years from actors the likes of Nicole Kidman, Sean Penn, Matt Dillon, Robin Williams, Matt Damon and River Phoenix, to name a few. Here he’s re-teamed with River’s brother Joaquin, who played one of Kidman’s teen lovers-turned-hubby snuffers in “To Die For” (1995). 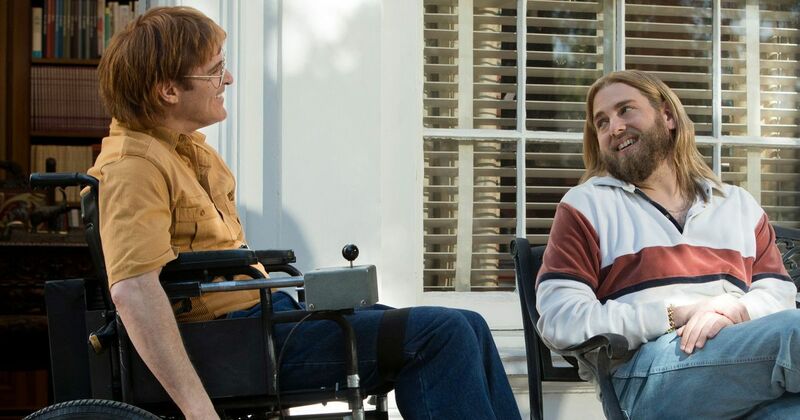 “Don’t Worry, He Won’t Get Far on Foot,” isn’t a topical grabber; it’s a biopic about an esoteric satirist/sketch artist by the name of John Callahan who died in 2010 after spending most of his adult life in a wheelchair, paralyzed from the waist down after a car accident involving a drunken driver. The terrible catch there being that the car was Callahan’s, driven by another (Jack Black) because Callahan was too drunken to drive. “Don’t Worry,” however, isn’t so much about overcoming physical difficulties and beating the odds, but about confronting one’s demons. As the film has it, Callahan has an angry closet full of ’em. A raging alcoholic from the minute we catch up with him to the alcohol rocket of an evening that ends with Callahan’s VW Bug wrapped around a cement post, the slacker handyman out for the next good time seemingly has little prospects beyond his shaggy good looks and winning smile – and then that too seemingly gets taken from him. Strapped to a hospital gurney in the cold, sterile aftermath, Callahan flirts with his physical therapist (Rooney Mara, impeccable and fetching in the small role) and when peppering his counselor (Rebecca Field) about the functionality of his equipment, she suggests with grave seriousness that he ask the night nurse to sit on his face. Callahan flashes his old smile and accepts the challenge gleefully. Out on his own. Callahan returns to the bottle with self-pitying vehemence. It seems a fast downward spiral, but he also starts drawing acerbic political doodles that get published (“the place that publishes Gary Larson just called”) and elicit strong public reaction. He also checks into an AA group led by Jonah Hill’s ultra-rich gay swami, Donnie, who presides over the flock with the smarmy, manipulative charm of a cocksure charlatan. Callahan takes to Donnie, but keeps boozing on the side with angry-man swagger. All of which makes for a gonzo 12-step ride. It might be treasonous to say, but Phoenix and Hill don’t have great chemistry. They’re fantastic, mind you, but not in the way Bogie and Bacall or Newman and Redford were, or even Damon and Affleck’s bros in Van Sant’s “Good Will Hunting.” When the two are on screen together the film is undeniably intoxicating in its own quirky right; if you were at a bar with this duo, you’d find it hard to close out your tab before closing time. But they’re just not pouring the same stuff. 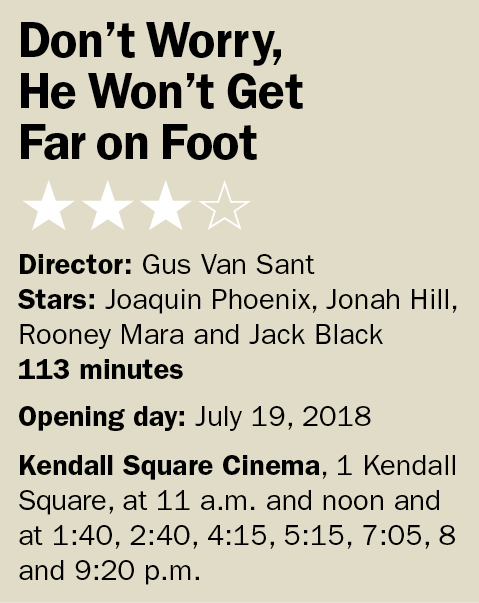 And sans the bravura performances – self-righteous Hill and self-hating Phoenix – I’m not sure “Don’t Worry” would be that interesting of a film. Cultural icons Kim Gordon, Udo Kier and Carrie Brownstein have small bits and feel plugged in but not necessarily engaged in the presence of the immersed leads. Gordon, best known for her work as a member of edgy ’90s rock band Sonic Youth, also had a small role in Van Sant’s “Last Days” (2006) the last chapter in the filmmaker’s Death Trilogy that reimagined Kurt Cobain’s demise. The other films in that series, “Gerry” (2002) and “Elephant” (2003), a repainting of the Columbine massacre, are similarly fact-based and likewise riveting. “To Die For” (1995) and “Paranoid Park” (2007) too might make apt bookends, and if you added in “Don’t Worry,” an individual alone in a country cabin for a weekend with the ability to stream such a double-triple program might emerge on Sunday depressed, enlightened and oddly invigorated. The most telling and frightening aspect of “Don’t Worry,” however, is its raw and honest depiction of addiction and the grip it has on the ensnared – and the ends they will go to in spinning a false narrative even as the knees of reality betray them.